Introduces the new Argan and Neroli Oil Roll-on Waxes, containing the ultra-nourishing exotic oils of Argan and Neroli. Speed waxing has never been so exotic until now! Unveiling clean+easy™ Argan and Neroli Oil Roll-on Waxes, enriched with miracle oils that help nourish and moisturize the skin while effectively removing all unwanted hair. Estheticians and clients alike will love Argan & Neroli Oil Roll-on Waxes as they take you on an exotic journey without having to step foot outside of the salon! These miracle oils drench the skin in moisture and allow the wax to easily glide during application making them the go-to formula for speed waxing. Both feature an intoxicating aroma to put clients at ease and capture an exotic escape. Conveniently available in large, medium and small 3 packs to accommodate full-body removal of unwanted hair. Ultra nourishing waxes with exotic oils of Argan and Neroli that allow the wax to easily glide during application for ultimate speed waxing. 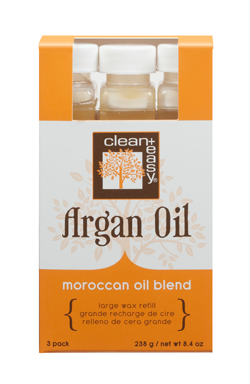 Argan Oil is rich in essential fatty acids & Vitamin E and features a warm, calm, earthy aroma. 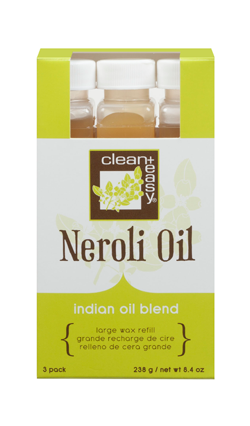 Neroli Oil stimulates cell regeneration & increases skin’s elasticity and features a refreshing, floral, citrus blend. Conveniently sized in large, medium & small 3 packs to accommodate full-body removal of unwanted hair.